Pool Route Sales Pool Route Pros, Inc. is a licensed broker that assists with the pool route sale process by strategically matching up buyers and sellers with similar ideas and interest to make the pool route sale transition as smooth as possible for all parties involved. Fee - Two Times (2x's) the gross monthly service income of the route for sale. Fee is built into the final purchase price. Consulting Pool Route Pros, Inc. offers consulting for many areas of the pool industry, ranging from service, repairs, growth options, employees, marketing, insurance, billing options, supply list, stores, equipment, technology, partnership, business opportunities, among many other things. Fee - Fees may vary. 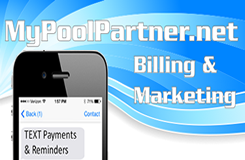 Please call 714-970-PROS (7767) or email us at tommy@poolroutepros.com with your questions. Other Sales Since Pool Route Pros, Inc. is a licensed broker it allows us, as a company, to assist with other business sales and opportunities for our clients. Some of the other sales and opportunities that we are able to assist with include, but are not limited to, tile cleaning companies, leak detection companies, pool repair companies, equipment sales, pool supply stores, employment opportunities, and more. Fee - Fees may vary. Please call 714-970-PROS (7767) or email us at tommy@poolroutepros.com with your questions. Web Design With as advanced as technology is in our world, you must make sure your business is relevant to all age categories, and the most popular source to find information in 2012 is by the worldwide web. Having a website for your business can increase your profit and generate 20% more business a year if marketed correctly. Fee - Fees will vary based on the intricacy of the website and how detailed the design. If you purchase a pool route through Pool Route Pros, Inc., you will receive a 20% discount on your website if you choose to have one. Facebook Business Landing Page Once you have a website, the next step is to have a business Facebook landing page to be able to generate more traffic to your website. To see an example of a Facebook landing page, see ours at www.facebook.com/PoolRoutePros. Fee - Between $100-$300 dependant on the intricacy of the design and the technologies used. Public Speaking Pool Route Pros, Inc. is available for public speaking at events such as association and chapter meetings, banquets, retreats, trade shows, and any other speaking obligation requested. Fee - Fees varies based on location of event, length of speech, and subject topic.